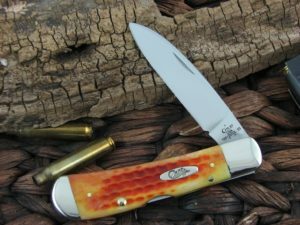 This is the Case Cutlery Peanut, has Burnt Salmon Bone handles and Brass liners. The blade steel is TruSharp and finish is Polished. *Our opinion: The pull is a 5. The Case Cutlery effort on this run as compared to their entire catalog is 9. Notes: The version has a bail. This is my favorite color & it has a bail. 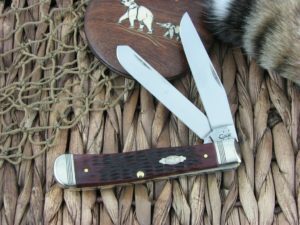 I have been looking for case knives with a bail. I am a woman and the only way a knife can be useful is if I can attach to my keys. Though this knife is so beautiful I don’t want to use it. I am so pleased with this knife! Thank you! 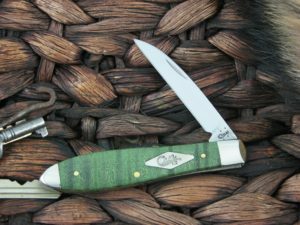 I really don’t understand why more case knives aren’t available with bails. 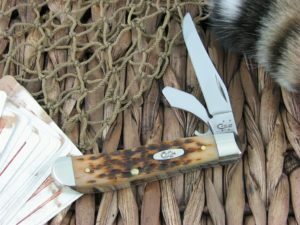 The only other 2 knives I had found with a bail were white & brown, which is better then none. Thank you for my new beautiful knife!